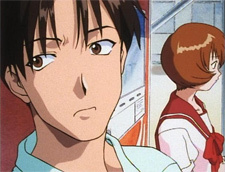 Aquaplus created a PC dating-sim game in 1997 called To Heart. Having inspired an animated series, two Playstation console versions, and a sequel game series, it’s easy to call To Heart a popular series in Japan. 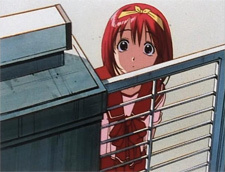 Just short of the 10th anniversary of the original game in Japan, RightStuf has released the first volume to the 1999 anime series featuring Akari Kamigishi and her childhood friend Hiroyuki Fujita. 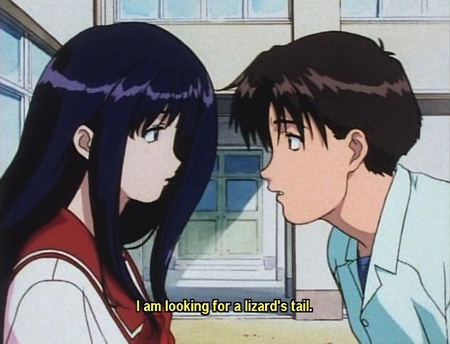 As we follow their high school days and growing number of friends, one can only reflect that you don’t see this kind of laid-back series very often in newer series from Japan. In the same vein as Boys Be…, get ready for an anime series about friendship and a little more in To Heart: Volume 1 – New Feelings. Release Studio: The Right Stuf International, Inc. The main focus of To Heart is the friendship between Akari Kamigishi and Hiroyuki Fujita, yet both view it in a different matter to start with. Hiroyuki is somewhat forgetful or just plain oblivious to matters between the two, which goes along with his laid-back nature. Akari, on the other hand, locks each precious moment away in her heart and in her diary as the two spend time together. This particular year the class seating arrangements have, by chance, been changed to have Akari and Hiroyuki sitting next to each other. Naturally we know, or at least hope, that this may eventually lead to something, but we’re getting ahead of ourselves. Our story opens with two children standing in the rain. The little girl has dropped her book and they’ve become soaked while the boy consoles her with the offer of using his own books. Fastforwarding to present day, we find Akari in her usual duty of getting ready for class and then hurrying down to Hiroyuki’s home to wake him up before both are late for school. In class we get a glimpse of the daily lives of our cast of characters. Hiroyuki is lazy by appearance, but will stand up for the right things at the right moment. Akari is the shy but cute girl who is too introverted to speak up, even around her friends. Shiho Nagaoka is Akari’s best friend and polar opposite. Shiho is all about having fun, gossipping, and carrying around the ego of being a superstar one day. This also puts her at odds with Hiroyuki’s more lethargic nature. And finally we have Masashi Satou, Hiroyuki’s best friend, who is a gentle, sweet-natured person that tries hard to see everyone be happy. The combination of personalities make for just enough friction to provide some light-hearted comical moments without a major clashing involving fisticuffs. With the introductions out of the way, we move on to the first major crisis of To Heart: seating arrangements. Yes, the first episode revolves around Akari promising Shiho that the gang would go karaoke after class, but first the class needs to choose new seats. The class whines about the decision and process until Hiroyuki steps up to assist 2-B’s class rep Tomoko with drawing lots for the seats. Akari smiles at the sight of Hiroyuki helping when he wasn’t keen on the idea of karaoke after class is over. But what makes her even happier is the payoff to the nervous anticipation of where she gets to sit for the school year. Akari finally gets to sit next to Hiroyuki after all these years of being friends. Episode two revolves around Childish An Hour being in town for a special concert. Of course, everyone wants to go see it, including our four regular friends. Masashi lands a pair of tickets from a CD store his sister used to work at. Hiroyuki is stunned, but then realizes that this means only two of the four can go to the concert. 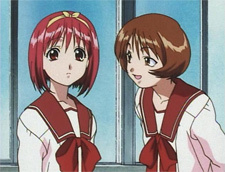 Hiroyuki takes up the duty of talking to Shiho and Akari to see what they think. Meanwhile, Shiho pulls some strings of her own and also ends up with a pair of tickets for the show. Akari is thrilled, but only two of them will get to see the show. So Shiho volunteers to talk with the guys over who should see the concert. Naturally, this leads to a lot of running around and misunderstandings between everyone involved. Our third episode properly introduces Serika Kurusugawa, daughter to the owner of the vast Kurusugawa business empire. Akari reminds Hiroyuki that he has to clean the courtyard that day. While sweeping leaves, he happens to run into Serika as she searches for a lizard’s tail. Together, the pair spend a while looking and come up victorious when Hiroyuki spots what Serika needs for her black magic potion. Having found a possible new friend, Serika lends Hiroyuki a book on the occult and invites him to join her at the Occult Club sometime. However, Hiroyuki doesn’t realize that Serika meant that day, which leads to lots of running around to resolve the mistake. The fourth and final episode for Volume 1 introduces yet another girl in the world of To Heart: Aoi Matsubara. Short in stature and hair length, the blue-haired beauty is a determined ball-of-energy wanting to start a Martial Arts Club. 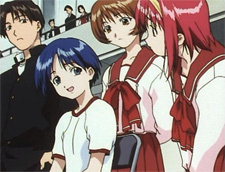 Most of the high schoolers blow off joining the club after hearing her speech, but Hiroyuki is intrigued enough to watch her train after school. It’s here that we delve into her desire to fight in the Extreme Tournament and her detractors who think Extreme fighting isn’t worthy of effort. 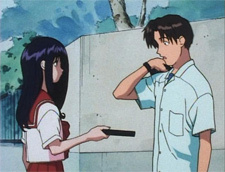 Hiroyuki joins in training with Aoi day after day, which leads Akari and Shiho to investigate what he’s up to after school. With Aoi’s detractor Yoshie confronting her over the Martial Arts Club, a fight match is suggested to see if Aoi’s new Martial Arts Club and Extreme fighting style are worth keeping around against Yoshie’s Karate Club and traditional fighting style. Shiho, Akari, and Hiroyuki join together to support Aoi’s dream and promote the demonstration match. To Heart is an adorable series that isn’t as common nowadays in anime coming to America. Only a few companies, like RightStuf, are brave enough to explore what is more and more considered niche anime in a world full of robots, harems, and weaponry. With the added bonus of working hard to restore the animation to its original luster, you can’t help but think this title ended up in the right hands. The Japanese cast is wonderful with tight performances by the main leads of Ayako Kawasumi (Akari), Kazuya Ichijo (Hiroyuki), Chieko Higuchi (Shiho), and Souichiro Hoshi (Masashi). You will not be disappointed in making this your first stop. But shows like To Heart need repeat viewings and Headline Studios has provided a quality cast of their finest to dub the series into English. Joe DiGiorgi’s direction and Sam Regal’s faithful adaptation make To Heart a good dub to check out. Rich McNanna’s Hiroyuki can have some rough moments, but overall he’s getting the character down enough that it shouldn’t be an issue next volume. Angora Deb nails Akari’s gentle, introverted nature and is a pleasure to listen to. Zoe Fries’ Shiho can be a little bit too over-the-top at times, but I think it’s better than under-performing the character. And Wayne Grayson’s easy-going delivery works well for Masashi. The only frowning parts are Karen Thompson being a bit too abrasive as Lemmy and Carol Jacobanis‘ Serika. Serika, who is subtitled in a tiny font just like her light voice, shouldn’t be understandable beyond a few syllables. Hiroyuki repeats everything Serika says almost word-for-word, so the English dub loses points for having her be too loud. To Heart: Volume 1 – New Feelings cannot be stressed enough as a “must have” DVD to buy. RightStuf continues their top-notch work with subtitles and translation. The video quality is quite good for being an older series and the restoration has brought back some good color and clean-up to the worn-out print. The only thing I miss is the booklet of extra material, interviews, and information like some of their other recent series have come with. The DVD extras do include line art, translation notes, and character bios, so most of what has been duplicated and extended in the booklets is on the actual DVD. Fans of To Heart in America probably know it from one of two sources: the game or the fact that Comic Party heavily features To Heart characters. If you are familiar with the series, you probably already own it. For those looking for something new to fill the void after finishing Boys Be… or just something different in general, you must give this show a chance to join your collection. To Heart will not disappoint.